The European Union is a “foe” of the United States and it was the EU’s mass migration crisis that sparked the Brexit movement, President Donald Trump said on July 14. “I think we have a lot of foes. I think the European Union is a foe, what they do to us in trade. Now, you wouldn’t think of the European Union, but they’re a foe. Russia is a foe in certain respects. China is a foe economically, certainly they are a foe. But that doesn’t mean they are bad. It doesn’t mean anything. 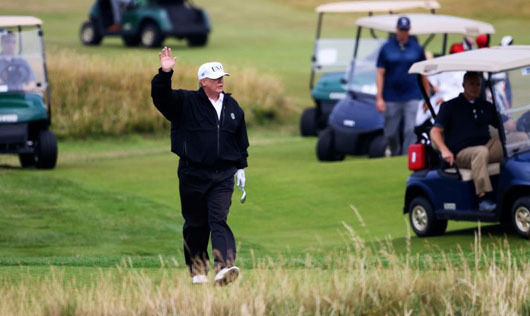 It means that they are competitive,” Trump said in an interview with “CBS Evening News” anchor Jeff Glor at his golf club in Turnberry, Scotland. “I respect the leaders of those countries. But, in a trade sense, they’ve really taken advantage of us and many of those countries are in NATO and they weren’t paying their bills,” Trump said. British Prime Minister Theresa May told the BBC on July 15 that Trump had encouraged her to “sue the EU” rather than negotiate over Brexit. Trump told The Sun newspaper that Europe’s migration crisis had sparked the Brexit vote, saying the impact on cities like London and Paris is “sad.” He also praised Hungary for its tough border policies. Mass migration has “changed the fabric of Europe and, unless you act very quickly, it’s never going to be what it was, and I don’t mean that in a positive way” Trump said. In an interview with Good Morning Britain host Pierce Morgan, the president said “You look at Hungary as an example. They’re not agreeing to do what some of the other countries did. Now it’s a very tough thing… yet [mass migration] is changing Europe. It’s seriously changing Europe. In the NBC interview, Trump reiterated his criticism of Germany as “totally controlled” and “captive by Russia” over a natural gas pipeline project, known as the Nord Stream 2. Trump traveled to Helsinki on July 15 ahead of his meeting with Russian President Vladimir Putin on July 16. He told Glor he has “low expectations” for the summit. “Nothing bad is going to come out of it, and maybe some good will come out,” he said.